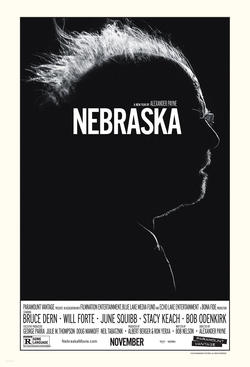 Alexander Payne’s latest film, Nebraska, has been called a number of things — a chronicle of economic depression in rural America; a satire of Midwestern values; an ode to the stark beauty of the Great Plains; and, perhaps above all, an ideal vehicle for veteran actor, Bruce Dern. In a sense, Nebraska is each of these things. And yet, more than anything else, it is a film about compassion. To have “compassion” is, quite literally, to “suffer with” (com-passio) with another. Thus we say that the compassionate person does not merely feel bad for one who is suffering but actually works to assuage one’s pain. It is a stance of solidarity or, better yet, the ultimate act of togetherness. After all, it is one thing to stand with a person when things are going well, but quite another when they are not. The compassion at the heart of Nebraska involves two main characters — Woody Grant (Dern) and his son, David (Will Forte). The movie opens with Woody, disheveled and grim, hobbling along a highway in Billings, Montana. A policeman stops him, and we soon learn that Woody is trying to walk from Billings to Lincoln, Nebraska, a distance of nearly 850 miles. It is a fool’s task, but it turns out that Woody is something of a fool. A naive yet strong-willed septuagenerian, he believes that he has won a sweepstakes prize from a Lincoln-based marketing agency. He wants to claim his million-dollar award, but no one will take him. His wife, Kate (a hilarious, foul-mouthed June Squibb), thinks he belongs in a nursing home, and his oldest son, Ross (Bob Odenkirk), is too busy trying to become “the Tom Brokaw of Billings.” That leaves his youngest son, David, who agrees to drive him, figuring, at the very least, it will get him out of Billings for a few days. And so they head east, across the Plains, which Payne’s black-and-white lens imbues with a sense of washed-out melancholy. It is at this point that the film’s central motif emerges. As Woody continues to prove troublesome (drinking too much, wandering off, losing his teeth), David is forced to try to understand him better. Why has he so often resorted to alcohol abuse? Why is he so sullen and taciturn? And, above all, why is he so adamant that he has won one million dollars? Through a series of events, most of which center on a pitstop in Woody’s hometown of Hawthorne, Nebraska, these questions are not so much solved as contemplated. David comes to see the world through Woody’s eyes, and he realizes that his father’s personality is an outgrowth of much pain and tragedy — a point that sheds light on the old man’s quixotic quest. For Woody wants to leave behind something for his family, something they (and he) will be proud of. Thus David must finish this journey with Woody, no matter how arduous or fruitless. That, indeed, is what it means to be compassionate. “We need to come out of ourselves and head for the periphery. We need to avoid the spiritual sickness of a Church that is wrapped up in its own world: when a Church becomes like this, it grows sick. It is true that going out onto the street implies the risk of accidents happening, as they would to any ordinary man or woman. But if the Church stays wrapped up in itself, it will age. And if I had to choose between a wounded Church that goes out onto the streets and a sick withdrawn Church, I would definitely choose the first one…”. To see from the periphery, as he puts it, is to look outward, beyond one’s own interests. It is, in other words, to treat others with compassion, to meet them where they are, even if where they are is difficult or disappointing. According to the Pope, this sort of compassion is not a weak-kneed capitulation, but a means of redemption. Nebraska agrees.